Matrurai Varadeeswarar Temple is a Hindu Temple dedicated to Lord Shiva located at Thiruvasi Village in Manachanallur Taluk in Trichy District of Tamilnadu. Presiding Deity is called as Maatrurainathar / Sameevaneswarar / Matrurai Varadeeswarar / Brahmapureeswarar. Mother is called as Balambigai / Bala Soundary. Tiruvasi (the corruption of its ancient name of Tiruppachil Ashramam) is located on the northern bank of river Kollidam (Coloroon). This temple is the 116th Devaram Padal Petra Shiva Sthalam and 62nd Sthalam on the north side of river Cauvery of Chozha Naadu. Appar has sung hymns in praise of Lord Shiva of this temple. Other Devara Paadal Petra Shiva Sthalams near this place are – Thiruvanaikkaval, Thiruchirappalli (Tiruchy Malaikkottai), Anbilanthurai, Thirumanthurai, Thiruppatrurai, Thiruppainjeeli, Mukkeecharam (Uraiyur) and Thiruverumbur. Lord Shiva in this temple is a Swayambumurthi (self-manifested). Saint Sambanthar sang a hymn and cured a girl from Muyalagan disease. 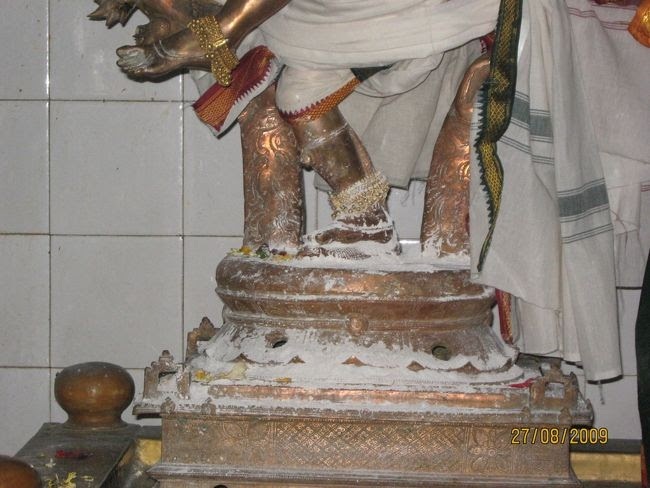 Lord Shiva gave a purse containing gold to Saint Sundarar here. This east facing temple has a 5-tiered main tower (Rajagopuram) and it has two corridors. It is believed that this temple is 1500 years old and was built and renovated by Kings of the Hoysala, Chola and Pandya dynasties. This temple is situated on the northern bank of the river Kollidam (Coleroon). The historical name of this place is “Pachil Kutrathu Achiramam” which has been changed to Pachilachiramam. As per the stone inscriptions, during the Chola and Pandiya period, the places on the northern bank of the river Kollidam was called “Parchil Kutram”. The village around it was called Thiruvachiramam. This was later changed to Thiruvasi. Also, in ancient times this place was densely populated with Vanni trees. For this reason, this place is also known as Sameevanam and the lord here is praised as Sri Sameevaneswarar. As Lord Brahma is believed to have worshiped the lord here, the lord is also known as “Sri Brahmapureswarar”. According to legend, this region was once called Mazhanadu and it was ruled by king Kolli Mazhavan. His daughter was suffering from a severe disease called Muyalagan (epilepsy), which could not be cured by any the king’s doctors. The king decided to leave his daughter in this temple with the hope that the lord would cure her. Saint Thirugnanasambanthar came to this place during his pilgrimage and found the girl in the temple. The king explained to the saint the sad story of his daughter and begged him for help. Saint Sambanthar sang a pathigam in praise of Lord Natarajar. Pleased with his pathigam, Lord Nataraja transformed the muyalagan disease into a serpent and danced on it. The lord then blessed the princess and cured her disease. Based on this event, Lord Nataraja appears here with his hair tied in a knot. Instead of his usual depiction of standing on top of Muyalagan, in this temple he is seen standing on a serpent. 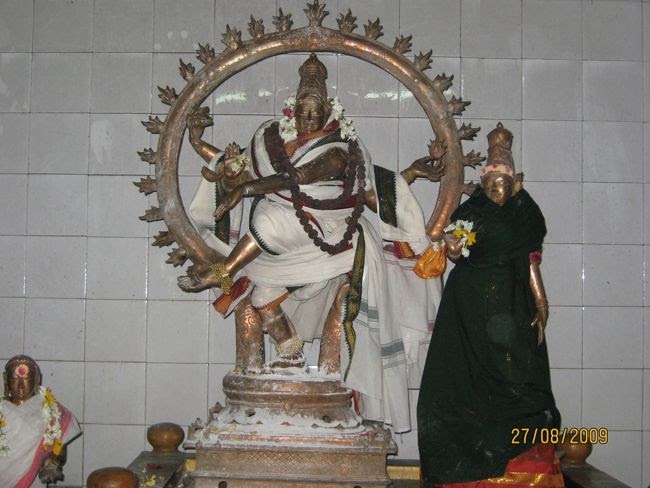 He is praised here as “Sarpa Nataraja” (“Sarpa” meaning serpent in Tamil). This is a rare posture of Lord Nataraja. On the Trichy to Salem road very near to Mannachanallur road is this ancient temple on the banks of the Kaveri. The temple has been connected with the miracles of Saint Thirugnanasambandar and Sundarar. From Trichy toll gate take the Musuri, Salem road and in about 20 Kms after crossing Bhikshandar Temple, Mannachanallur road you will come to the village of Tiruvasi. A right turn here leads to the temple inside the village.